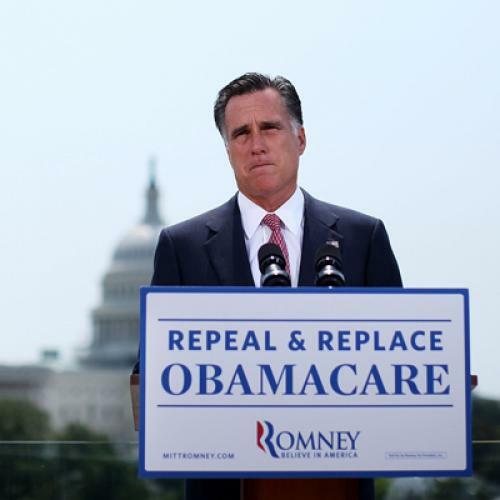 Would Mitt Romney preserve the best parts of Obamacare? That’s what he told NBC’s David Gregory, in an interview that aired Sunday on “Meet the Press.” The press is treating it as another flip-flop but I’m not sure that’s fair. As the campaign subsequently confirmed, and as conservative writers like Yuval Levin pointed out, Romney was apparently referring to some relatively minor reforms he’d endorsed already. He still wants to repeal the Affordable Care Act, he still wants to end Medicare and Medicaid as we know it, and he still wants to change the tax treatment of health care—a series of changes that would, if enacted, leave tens of millions of people vulnerable to punishing medical bills, in many cases because they had no insurance at all. But journalists (like the Huffington Post's Sam Stein) who noticed Romney’s statement jumped on it for a reason. Romney’s answer implied that he was determined to make sure everybody with pre-existing medical conditions can get adequate health insurance. Romney even mentioned his Massachusetts reforms—which, of course, were the precise template for Obamacare’s coverage expansion. A few months ago, when Romney was seeking the Republican primary, he put greater emphasis on his determination to repeal the law. That may tell us something about the changing state of the campaign and, just maybe, the changing politics of health care. Here’s the issue: As you know, the Affordable Care Act would prohibit insurers from denying coverage or charging higher premiums to people with pre-existing conditions. (Insurers try to avoid these people because, naturally, they generate much higher bills.) The Affordable Care Act would also provide subsidies for private insurance and make Medicaid available to everybody with incomes below 133 percent of the poverty line. If Romney repeals the law, Gregory wanted to know, what would happen to people who had pre-existing conditions? Well, I’m not getting rid of all of health care reform. Of course there are a number of things that I like in health care reform that I’m going to put in place. One is to make sure that those with pre-existing conditions can get coverage. The last time somebody from Romneyland promised federal help for people who can’t get health insurance, conservatives like Rush Limbaugh were furious. (How dare Romney suggest government help people with serious medical conditions!) This time, an anonymous Romney campaign aide quickly reassured conseravtives, via a statement to National Review, that Romney had no intention of keeping Obamacare’s requirements that insurers cover all people: “in a competitive environment, the marketplace will make available plans that include coverage for what there is demand for. He was not proposing a federal mandate to require insurance plans to offer those particular features.” Later an aide (perhaps the same one) explained that, during the Gregory interview, Romney was merely restating his previous position: That people with pre-existing medical conditions should have access to comprehensive insurance, so long as they already have coverage. For people in this situation, Romney and the Republicans have traditionally said they favor coverage through “high-risk pools.” But high-risk pools are basically substandard policies: Although they cover catastrophic expenses, they leave people exposed to huge out-of-pocket costs. They also tend to be underfunded, because they cost a lot of money but serve only a small number of people. As Jonathan Chait notes, it’s almost impossible to imagine that Romney and Ryan, who have promised massive reductions in domestic spending, would supply these programs with the money they need to operate adequately. So what would this mean in practice? Imagine for a second that you have cancer, diabetes, or Parkinson’s. With the coverage you’re likely to get form a high-risk pool, chances are that you’ll continue to struggle with medical bills. You’ll end up going into financial distress, just to cover your health are costs, unless you decide to start skipping treatment. And that’s obviously not a very good idea. These policies are better than nothing, for sure. But what you really need is comprehensive insurance and way to pay for it—in other words, the kind of protection that the Affordable Care Act will provide, starting in 2014, unless Romney and the Republicans repeal it. Romney’s position wasn't a political problem during the Republican primaries, when the voters wanted nothing but full repeal of Obamacare. But it may be a political problem now. The health care law as a whole is not particularly popular, but protections for people with pre-existing conditions are. Note that Romney’s position on pre-existing conditions was one of the topics Bill Clinton took up in his speech last week. Now that the Republican convention is over, Romney would probably like to persuade voters he’s full of concern for people who, because of a medical problem, can't get affordable health care. Maybe he should have thought of that during the primaries, when he committed himself to an agenda that might actually leave them with less access than they have now. For more, by the way, see Steve Benen, Kevin Drum and Austin Frakt.